The Plymouth Yacht Club is a very special place to both its members and visitors. As with so much of Plymouth, Massachusetts, our club is replete with history and is, in fact, a very part of this historic town. From time to time, there are opportunities to join the group of people who share in this seaside organization. To that extent, this page is dedicated to outlining how one would go about becoming a member of Plymouth Yacht Club. Membership Committee takes action on membership applications after November 1 of the fiscal year. Plymouth Yacht Club fiscal year is from Oct. 1 to Sept. 30. The packet must be complete. To facilitate the application process, completed applications should be submitted the 1st of the month. Applicants will be notified if there is a waiting list. Applications are processed in order of receipt of completed package. Plymouth Yacht Club does not provide members with a mooring. Contact the Plymouth Harbor Master for information about moorings. New Members Social invitation only is held at the Plymouth Yacht Club on the last Wednesday in April. This Social is a special event for New Members, Sponsors, Flag Officers and the Executive Committee. Both Sponsors should accompany the new member(s) to the New Member Cocktail Party. Sponsors must be members in good standing of the Club for more than two (2) years. Members on Leave of Absence are not permitted to sponsor new members. As a sponsor of a potential member, you have a responsibility to ensure the best possible applicants are presented for membership to Plymouth Yacht Club. It is the role of the sponsor to bring the potential members to the Club as a guest to familiarize them with the Club, events, and activities. Sponsor letter should include but not limited to an introduction, how long and in what manner sponsor knows the applicant, occupation, family, and boating information. Use letter size stationery. Include sponsor and applicants’ address, email and telephone number on all correspondence. A nonrefundable deposit of $200 (Note that the deposit will be applied to your dues at the time of election). Applicant’s letter should include but not limited to introduction, applicant, occupation, family, and boating information. Use letter size stationery. Include applicant’s address, email and telephone number on all correspondence. 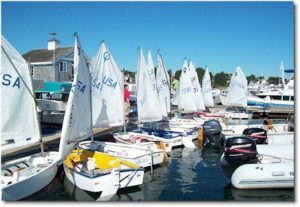 Upon receipt of the completed packet membership applications will be mailed to potential members as soon as there is an opening in the Plymouth Yacht Club membership. Consideration is given to Young Family Members* who are turning 21 or 25, as the case may be, who are requesting a Young Adult Membership. Family Members who request Young Adult Membership before the age of 30 are not required to pay the assessment fee. Former Family Members who request Active Membership at the age of 30 or after are required to pay one-half of the assessment fee payable over two years. Sponsor letters are not required (Plymouth Yacht Club Yearbook 2014 page xix). Members, except Life and Honorary Members, are elected the Executive Committee. The Executive Committee meets on the 3rd Monday of each month. The applicant then is either put on the wait list or presented to the E-board at the next available meeting to be voted on. Membership Applications the Executive Committee shall not take action on any application for membership until the name of the applicant shall have been posted for at least seven (7) days in the Clubhouse unless this requirement shall have been waived for a stated period joint action of the Executive and Membership Committees. All applications for membership shall be accompanied check for the appropriate annual dues and assessment fee. Deposit of annual dues any applicant not elected to membership shall be returned forthwith. For additional information contact Plymouth Yacht Club.